The New York City Department of Education policies for special education children, especially autistic children, is, in my opinion, abominable and against Federal regulations and laws. It seems to me that someone figured out that if autistic kids can't talk, anything that is expedient is ok. And, anything that will save money. See Preet Bharara's letter to former NYC DOE General Counsel Courtenaye Jackson Chase. I have written many articles about this on this blog and my website. This, mixed with the lack of accountability for principals (see here as well) and the lack of support for teachers (who can talk) who dare to speak out about the confinement situations, environmental hazards, violations of IEP mandates, false records for service providers and lies to parents all adds up to a terrible injustice. This has been on-going since I started helping my daughter get an IEP in 1993, then in 2001 the AP for Guidance at Stuyvesant High School, Jay Biegelson, wrote his name as her father on a new IEP secretly created with out my knowledge or consent which de-certified her. Eleanor Archie justified this by saying that they called me but I never responded. Lies, all lies. She never heard of caller ID. And, I was at Stuyvesant almost every day, as I was on the Executive Board and Editor of the PA Bulletin, the newsletter for the Parents Association. 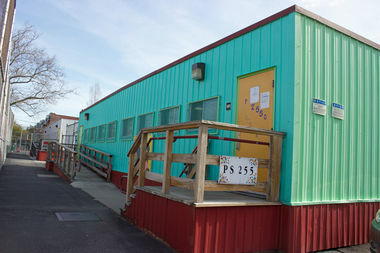 WOODSIDE — More than 100 special needs students who've been learning out of trailer classrooms for the past 16 years are finally moving into a permanent school building this fall, city officials said Monday. Students of P.S. 255, an elementary school for autistic children, don't have a building of their own and are instead spread out across eight sites in Queens, including 11 trailer classrooms housed in the schoolyard of P.S. 151 in Woodside, according to officials. The latter of the students were originally housed in a Catholic school building in Long Island City, but they outgrew the space and were moved into the trailers at P.S. 151, where they have been since 2001, according to DOE spokesman Michael Aciman. The trailers were initially only supposed to be at the school for only two years, but more were added over time to accommodate the growing number of P.S. 255 students being taught there, according to a Queens Chronicle article from 2007. Now, the city will remove the long-standing trailers — or what the DOE calls "Transportable Classroom Units" or TCUs — from P.S. 151 and relocate the 105 P.S. 255 students to another former Catholic school building in Astoria starting in September. The new building at 32-52 37th St. was once home to the Most Precious Blood Catholic School before it closed in 2015. It currently houses a city-run pre-K program, though it has enough space to accommodate P.S. 255's student body next year, according to the DOE. Councilman Costa Constantinides, who represents Woodside, expressed relief over DOE's plans to relocate the students, noting that the trailers have actually been around closer to 20 years and have become rundown. "The trailers have been getting older, and damaged — they're not the ideal learning spaces for our students," Constantinides said. "It's become obvious for everyone that they need to be removed." The special needs school has seven other sites in Queens, but only students at the Woodside location are taught in TCUs, Aciman said. The city's Panel for Educational Policy is expected to approve the plan to relocate the students at its meeting in April. The city's use of trailer classrooms has been a source of contention for years, as critics say the units are often used for much longer than their intended lifespan. Mayor Michael Bloomberg once pledged to eliminate the use of TCUs by 2012, though the DOE has continued to open new trailer sites in neighborhoods with overcrowded schools, including in Hunters Point and Corona this past fall. During the 2011-2012 school year, more than 8,000 city students took classes in trailer units, DNAinfo New York reported at the time. That number dipped to 6,767 students during the 2015-2016 school year, according to the DOE. At Monday's announcement outside P.S. 151, DOE Deputy Chancellor Elizabeth Rose said the city is working to make sure the downward trend continues. "We have over $400 million in the capital plan to remove TCUs citywide," she said. "We are excited to continue making this progress for that goal." Steve Koppelman, whose son is in first grade at P.S. 255 and is taught inside the trailer classrooms, called the relocation plan "just terrific." "They’ve been keeping these up about as well as you can keep up 20-year-old trailers, but they’ve been very starved for space," he said. Removal of the trailers will also open up more outdoor play space for students at P.S. 151, who currently have recess in an unoccupied corner of the schoolyard next to the TCUs. The city will begin planning the construction of a new playground at P.S. 151 once the trailers are removed, officials said.